Following a night of persistent rain, the day began under heavy skies and the occasional spots of drizzle. 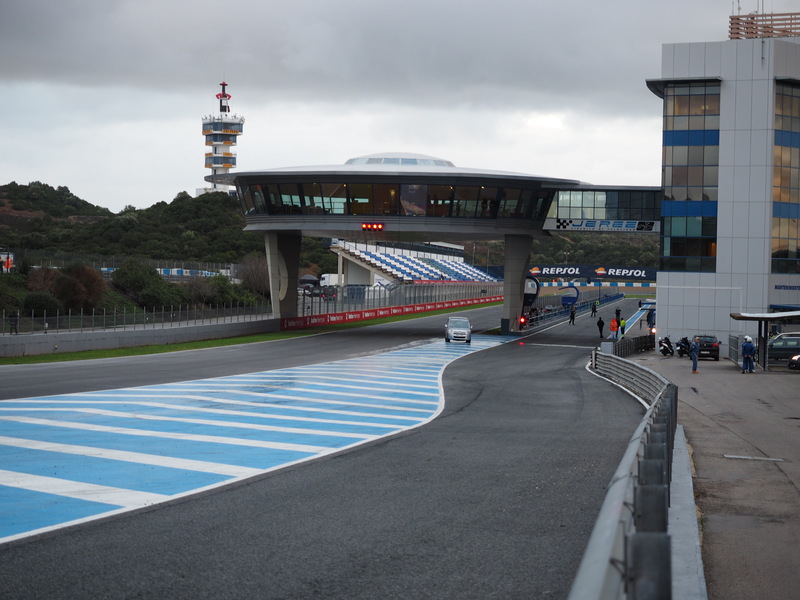 Pirelli were delighted as they’d previously indicated they wanted at least one wet weather day in Jerez to test the intermediate and full wet tyres. The Italian tyre manufacturer had planned to soak the track on Friday should the weather gods refuse to oblige. 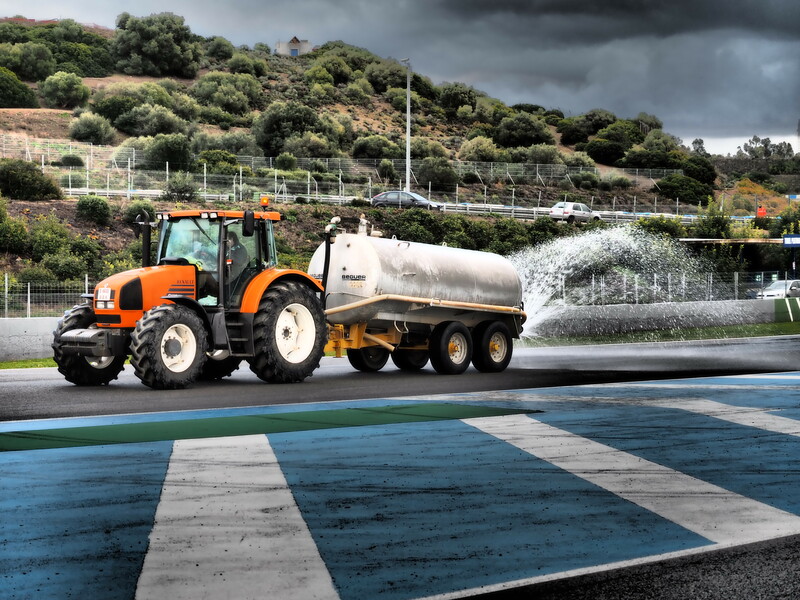 Yet for the past 3 years in Jerez, we have seen all 12 days run under clear blue skies so Pirelli should have known they would more than likely have to provide the water themselves to simulate wet weather running. The by 8am the track was damp by wet running standards in F1, the cars would have cleared the odd patches of water in a couple of laps. Pirelli announced they would make today their wet running day and sent out the order to douse the circuit. Formula 1 is a billion dollar sport and what followed next was incredible. A tractor emerged with a tank of water behind it on a trailer and proceeded to trundle around in single digit kph as the water spewed from an open valve at the back. As the farm vehicle plodded up the hill to turn one, the camber towards the inside of the track drained the water away almost instantaneously. Between turn 1 and turn 2, on the outside edge of the track – the racing line – the water held for around 30-45 minutes and provided Kimi with a couple of bum twitching moments as he got on the power too early and flicked out the back end of his Ferrari. The session was delayed until around 09:20 as marshall posts were empty and security vans buzzed around dropping off the errant personnel. The tractor finally admitted defeat and was seen no more and we got under way. Whether Pirelli actually have a better plan for Friday to soak the track and today’s palaver was a last minute opportunistic effort to enhance the natural weather conditions is not clear. What is clear is that the tractor and trailer are not delivering 60 litres of water a second which is the rate that an F1 wet tyre shifts it. Ah well – only in F1 huh? Anyway, day 2 was much better for many of the teams than yesterday. Jenson finished the day top of the time sheets with a 1:24 which is around 7 seconds off the pace of the best lap in Jerez testing in 2013. The cars are expected to be around 4s a lap slower this year, and there was still plenty of short shifting and even my non-technical ear suspects we are yet to see a new V6 turbo rev to the full 15,000 rpm. There was an interesting little incident following Esteban Gutierrez’s excursion into the gravel around turn 5 before the back straight. The Mexican had misjudged by some margin his entry speed into the corner and a TJ13 operative was there to witness it all. Having failed to make it out of the gravel, the dejected Sauber driver finally gave up the ghost and climbed from his car whilst the jolly marshalls smirked and joked amongst themselves as they began their task of recovering the vehicle. As four members from Esteban’s team arrived in a car to inspect the damage and scrape the gravel from under the floor pan, a dark Mercedes saloon roared up driven by non-other than Mr. Niki Lauda. Out jumped his passenger, who bore more than a passing resemblance to the good doctor Marko, and he proceeded to snap away taking pictures of the rear end of the stricken Swiss teams car. Job done, taxi driver Lauda escorted his partner in crime away in a flurry of dust. TJ13 broke the story of the dodgy Renault crankshaft on the eve of the Jerez test. Renault cars have been conspicuous by the absence over the first 2 days, with Toro Rosso failing to appear today having broken down on track yesterday – Tuesday. Caterham managed just 11 laps today before Ericsson stopped on track. The green team claimed they would get Marcus back out but tweeted at 16:56, “DOH. Beaten by the clock”. Sebastian Vettel flew home late afternoon having cancelled his scheduled press duties after completing just 8 laps today to add to his 3 from yesterday. His smoking bull in the garage was a sorry sight for all fans of the Milton Keynes team. Lotus decided to troll Red Bull as they tweeted @takiinoue, “we miss you, like Red Bull misses their mileage today”, though the boys in Enstone may not be aware of troubles ahead when they bolt their powertrain on in Bahrain. TJ13 learned today that prior to the test, Renault instructed their teams not to run each engine at this test for more than 250 kilometres – that’s just 56 laps. Further, there are no multiple powertrains for each of the teams to use in Jerez, hence the paucity of Renault teams mileage. These engines have been on the drawing board for almost 2 years, and with just 6 weeks to go to the Australian GP, have the French engine manufacturer who dominated the V8 era dropped a bollock of nuclear proportions which may have repercussions for many months into the new F1 season? Any scuttlebutt on the McLaren rear suspension link aero devices ? Innovation’s not quite dead yet! Very nice. Tell us more! Is it simply a cranky crankshaft? 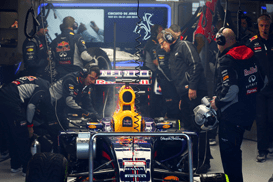 What’s wrong with the Renault engine? Powertrain – not just engine anymore. Given their history, dodgy electrics is more likely – and less quickly fixable than a dodgy crank. Bahahaha that is too perfect. The Watchmen pull up in a black Merc for happy snaps? Or pot shots? Regardless, seems Renault teams are up shaft crank without a pedal. this was a fun report to read! thanks!!! Bastards.. As we like to say over here, Hang ’em high judge. Pace the Hippo, does anyone else think the Williams is actually rather a good looking car ? Thought I saw a report that it was wiring, Google translate FWIW, not sure if it was K or H that caused the problem. Related to TR’s of yesterday tho. Lauda and Marko(?) just went to the bottom of the s**t heap in my ‘ever so ‘umble’ opinion…! Excellent stuff your honour, between twitter and this place, there is no point reading any other news! That thing pulling the water tank is better looking that the green abomination (a.k.a. Caterhame CT05) and a few of his cousins. When did Renault advise their customers of this? Before or after Lotus abandoned plans to be here?